Great food, wine and culinary experiences bring people together. So does the love of our pets. Just a few conversations by phone, email or Facebook and all of a sudden you have a real connection with another person and go out on a limb of sorts…you send a box of cherries to someone you have never met before. Fresh food gifts from new friends. Is there anything better? Especially when the gift is a box of perfectly ripe and gorgeous red cherries from a farm in Montana. Montana. The state that has recently been called, “The Last Great Place” may be just that and we hope to travel there soon. 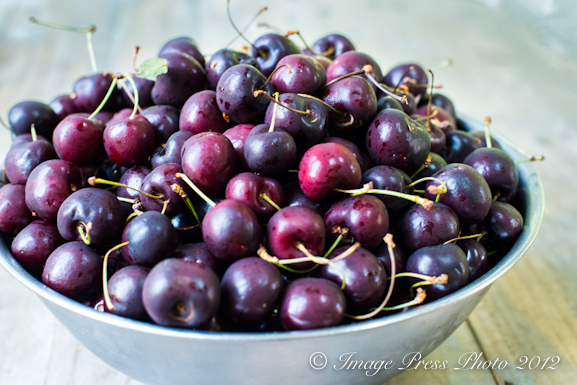 In the meantime, while daydreaming about the wide open spaces, breathtaking mountains and big blue sky of Montana, I am also reminiscing about those fabulous black, sweet and juicy cherries that were sent to us several weeks ago. Cherries that filled the mouth with luscious fruit. They were the best cherries we have ever eaten. What to do with a bowl of gorgeous cherries?? 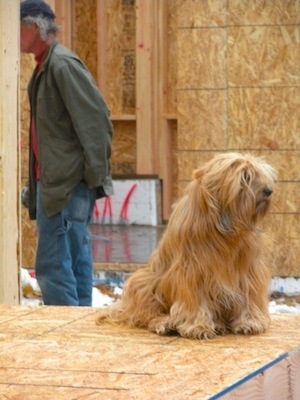 I met Sheryl Getman earlier this year when Beamer, our Tibetan Terrier (TT), was paralyzed from a rabies vaccine. We were introduced through a mutual friend and TT breeder as I was searching for answers on how to treat Beamer’s paralysis, since very few veterinarians know much about this condition. Sheryl currently has six TT’s and has been a breeder off and on during the 20 years of being involved with the breed. Tibetan Terriers are unique, mysterious and are known as “little people” because of their behaviors. There is something very special that binds their owners. It is hard to put in to words other than to say that TT owners receive great joy being a part of the lives of the “little people” and being a part of the Tibetan Terrier community. Beamer has been with us for almost almost eleven years and I can tell you that we are spellbound by his personality and unexpected characteristics. I have to thank Sheryl and a few other TT owners for their encouragement and support when we thought we would lose Beamer. It was a very emotional and trying time for us. Sheryl and I have become online friends through Beamer’s challenges and have connected over another love, cooking. Sheryl has been around fresh food and farming all of her life. She grew up in Montana in a home where her parents and grandparents raised or hunted much of their own food, fueling her passion for great food at an early age. Sheryl’s grandmother was a gourmet cook at a hotel. Her mother was also an excellent cook and baker so there were never any packaged or processed foods in her home. Everything was prepared from scratch. Sheryl honed her skills at home in the kitchen when she was young. Combining her love of art (another passion) with her culinary skills, she entered the restaurant business after college. Throughout her life, Sheryl’s obsession with cooking and art has inspired her travels to faraway places like the Chinese Provinces, the Philippines, and France and then to New York and San Francisco to expand her culinary ability and experience. In the late 1960‘s she studied cooking at several Chinese restaurants in San Francisco and with wives of Asian doctors. There she learned their recipes and how to incorporate good food for health. This pie is beautiful! Love this idea! Gorgeous gorgeous pie! Stunning! And now I am sad that cherries season is over here – but I’ll come back to this recipe next year for sure! 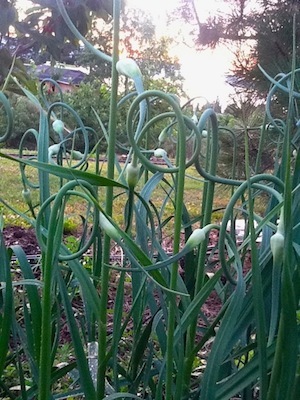 The farm and that landscape are beautiful – and they are living a life my husband dreams of. It takes courage as well as passion and kudos to them for doing it. And the dogs on the back of the cart are wonderful! Thank you. This does look like a perfect way to live life. They work hard and enjoy the fruits of their labors. Literally. I can’t imagine the fun their Tibetan Terriers must have running around the orchard and farm. They are really intriguing dogs. Your pie looks so good, but I don’t think that I can find cherries anymore…But still, I’m in the mood for a pie or tart of some kind, so I must find myself a fruit and bake it. Too bad that I dropped my kitchen scale earlier today, and until I get a new one next week, I have a few recipes I’ll have to postpone.. Sorry to hear about your kitchen scale. That could be a problem is you measure all of your ingredients. I am not sure where you live, but I have seen fresh cherries in our markets in Atlanta over the past week. I hope you are able to make this pie or apple pie is always a great choice come fall. I also ordered Sheryl’s cherries and I agree that these were the best cherries I have ever had! I will be ordering a larger amount next year as I didn’t get as many in the freezer as I had planned. After a baking a large cobbler, I must admit we were eating them as is as a mid-afternoon treat as well as a quick dessert. I know. They were fabulous and Mr. B wanted to snack on them. I had to hurry up and get them pitted and frozen so I could enjoy them later in a few desserts or dishes. 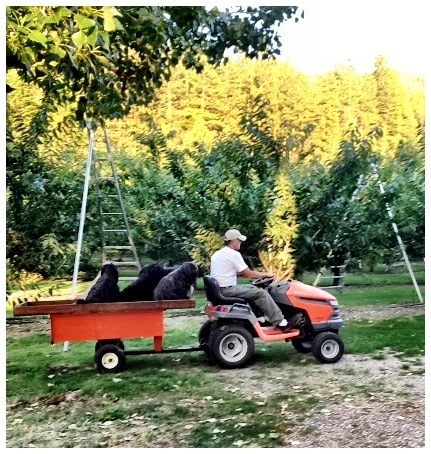 I know where to get my stash of cherries next year…Montana! Thank you for the lovely article. We are inspired and dedicated. Most of your readers know, there is great pleasure in sharing. We truly love to share the results of our work and study. 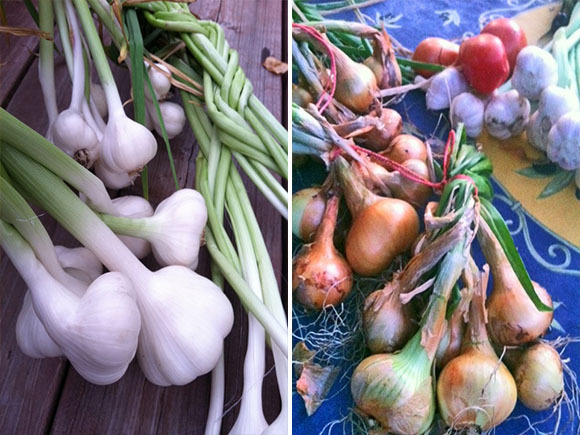 With clean water, good soil and clean air, we can bring fine and better foods, to the market place, for all to enjoy. It can make life so much more delightful. Happiness comes from enjoying the lovely moments in life. The table is often the place where we all can meet and share; making those wonderful moments happen. Gwen, your work is always beautiful, informative, and inspiring. You are most welcome and thank you for your thoughtful comments. I agree, it makes life better when we can share what we have learned through our hard work and efforts, especially when it is in the form of great food that is better for you. We admire what you and Dan do and hope to meet you and the TT’s in Montana some day. We can enjoy some great food, wine, and friendship together. Sheryl is my eldest sister and most like our mother when it comes to the kitchen. (although my other 2 sisters are pretty good cooks too). Sheryl whips up delicious meals, treats, desserts so effortlessly while chatting about other events. It’s almost like…background music, and I am always amazed that she can do this so effortlessly and so gracefully. It’s almost like watching a dance. When I visit, (I live in Oregon) she always bakes me a pie (or 2 or 3) that she whips up in a heartbeat…stating she didn’t know if I wanted cherry, peach or apple. 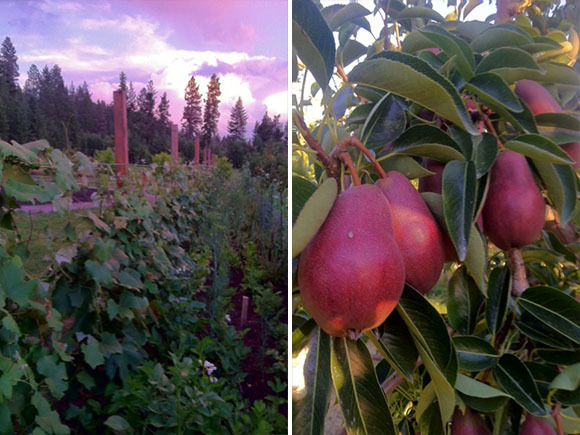 She and Dan work from sun-up until …well, lets just say it’s very “normal” for them to have dinner at 10 pm, when Dan comes in from working in the orchard or on the new house, while Sheryl works on her art, garden, putting up preserves or a million other things that she does during the day. They don’t seem tired…why is that? Because it’s not work to them…they love what they do and don’t want to stop. Their TT’s are right along beside them day in and night out. They are amazing folks and great parents to their “little people” TT’s. I can attest to them having the best cherries I’ve ever come across. Yummy…my mouth waters thinking about them! Thank you so much for your lovely comment. Sheryl does sound like the ultimate multitasker. I could not deal with the six TT’s, let alone a farm and all the preserving, cooking, and other activities. I knew when we spoke some time ago that she was talented in the kitchen, but learning how she and Dan manage the farm themselves was shocking. It is quite an undertaking, but obvious that they love what they do and that is what is most important. Sharing with others at the end of the day is even better and we certainly appreciate Sheryl sharing some of their amazing cherries and their story. The Getman farm looks idyllic to say the least. That picture of the plums is unbelievable! And I don’t know about that cherry pie – it is PERFECT, like a fairy tale pie. Is it even possible? My taste buds are going mad and my eyes won’t let me believe what it is seeing. A great post Gwen! Thank you, Maria. The pie really did turn out beautifully. It was due in part to those lovely cherries. I wish we could find some like those in Georgia! Holy crap, Gwen – that is one gorgeous cherry pie! Let me tell you..you claim not to be a baker, but you’ve got the gift! That said..I love the photos of the farm. It”s always been a dream of mine to own a farm (our second house when we’re rich lol). Don’t laugh..but I’ve been looking at chicken coops lately..online only..SO FAR. Beautiful post and pie! We want a chicken coop and a farm, too, so no laughing here. It is our dream to move out of the city and own a small farm one day with chickens and a few animals. Looking at the photos of Montana, I could sign up for going there! BTW, I do love to bake, so thank you for the comment about the pie. I just don’t do it often since it’s just the two of us and we don’t need the sweets. I have a few slices of leftover Cherry Pie in the freezer right now. It was hard not to eat the whole thing! This is so good! I bet it will be great with sour cherries, too. The original recipe was made with sour cherries, but had an option for making the pie with sweet cherries, which is the recipe I posted. 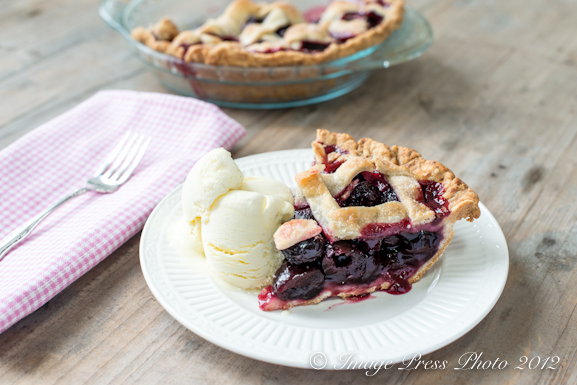 If you want the original recipe, here is the link: http://www.epicurious.com/recipes/food/views/Classic-Sour-Cherry-Pie-with-Lattice-Crust-242514. What a sad story about your dog. I hope he is doing better. 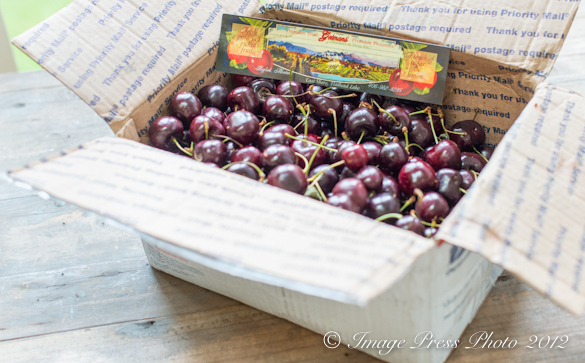 I love cherries and love ordering fruit from the best farms across the country. I am so excited to check out their site. I love cherry pie too, and this looks wonderful!